At Living Well Home Medical Equipment is a full service provider. When you call or visit Living Well Home Medical Equipment you can be assured that our knowledgeable, compassionate staff will listen to you to provide the best solution. Please Contact Us Toll Free 1-800-667-0158 or visit us at 755 Erskine Ave in Peterborough for more information about any of the services we offer. We’ll help you discover the funding sources available and also help you to navigate the processes involved. We even deal directly with insurance companies to make your purchase easier. 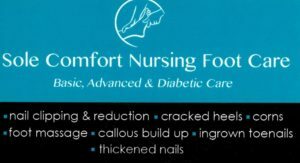 Living Well HME is proud to host Christine Thomson of Sole Comofrot Nursing Foot Care. Christine will be on location the Third Wednesday of every month running her medical nursing foot care clinic! Christine offers the ability to treat skin, nail and foot conditions and can offer advice on preventative treatments. As a Medical Foot Care Nurse she has the skills and knowledge to help the overall health of the feet. Christine is often busy diagnosing and treating various foot problems such as ingrown toenails, fungal infections, Athlete’s foot, warts, etc. When you can’t make it to our store, have us bring your product to you. We’re even available to provide setup services as well. Living Well Home Medical Equipment employs factory-trained technicians that can repair and maintain your home healthcare product so it continually provides the maximum benefit. If the need arises we are even able to perform some repairs right in your home. Living Well Home Medical Equipment carries a wide variety of products in an affordable rental pool for short-term home medical equipment solutions. We provide special programs to more effectively service the needs of long term care facilities and their clients.